Elders agent Keith Crouch and Rob Cornish of Strathdale, Mitchell with the Charolais heifers that sold to 288c/kg, reaching a top of $1108 to average $1039. Cattle were primarily drawn from the local supply area and a large panel of buyers was present, with increased restocker activity once again. Young light weight cattle were yarded in numbers, with heifers outnumbering steers and the quality was good. A limited number of grown steers, grown heifers and cows were yarded. Prices continued to rise across most categories. Light weight yearling steers under 280kg to restockers increased by 12c, while the medium weight yearling heifers under 330kg to feed increased by 29c/kg. Medium weight 2 score cows sold 22c dearer, while the medium weight 3 score cows increased by 6c/kg. Calves made to 326.2c to average 281c/kg. Light weight yearling steers under 280kg to restockers sold to 330.2c to average 303c/kg. Medium weight yearling steers under 330kg to restockers sold to 316.2c to average 301c/kg. Medium weight yearling steers under 400kg made to 307.2c to average 298c/kg. A small sample of heavy weight yearling steers to feed sold to 296.2c to average 296c/kg. Light weight yearling heifers under 280kg to restockers sold to 276.2c to average 253c/kg. Medium weight yearling heifers under 330kg to feed made to 288.2c to average 257c/kg. Medium weight yearling heifers under 400kg to feed also sold to 288.2c to average 276c/kg. The largest sample of grown heifers made to 246.2c to average 224c/kg. Medium 2 score cows sold to 197.2c to average 189c, while the medium weight 3 score cows sold to 224.2 to average 218c/kg. Heavy weight 3 score cows made to 234.2c to average 213c/kg. Weaner steers under 220kg topped at 326c/kg and averaged 300c/kg, weaner steers in the 220-280kg range reached 314c/kg and averaged 292c/kg. Steers in the 280- 350kg range reached 330c/kg and averaged 286c/kg, and steers in the 350-400kg range reached 290c/kg and averaged 270c/kg. Feeder steers in the 400-550kg range topping at 296c/kg and averaging 284c/kg. Cows and calves hit $800/unit. B & D Cooke, Turana, Meandarra sold Simmental cross steers to 330c/kg, reaching a top of $994 to average $928. L Adams, Booringa Downs, Mitchell sold Brangus cross steers to 326c/kg, reaching a top of $513 to average $513. RD Pastoral, Richmond Downs, Roma sold Angus steers to 318c/kg, reaching a top of $663 to average $598. The Angus heifers sold to 282c/kg, reaching a top of $531 to average $480. Mirradong Meats Pty Ltd, Middle Creek, Moonie sold Santa cross steers to 314c/kg, reaching a top of $839 to average $761. The Angus cross heifers sold to 264c/kg, reaching a top of $788 to average $695. Biscable Pty Ltd, Sunnymead, Roma sold Angus cross steers to 310c/kg, reaching a top of $745 to average $651. 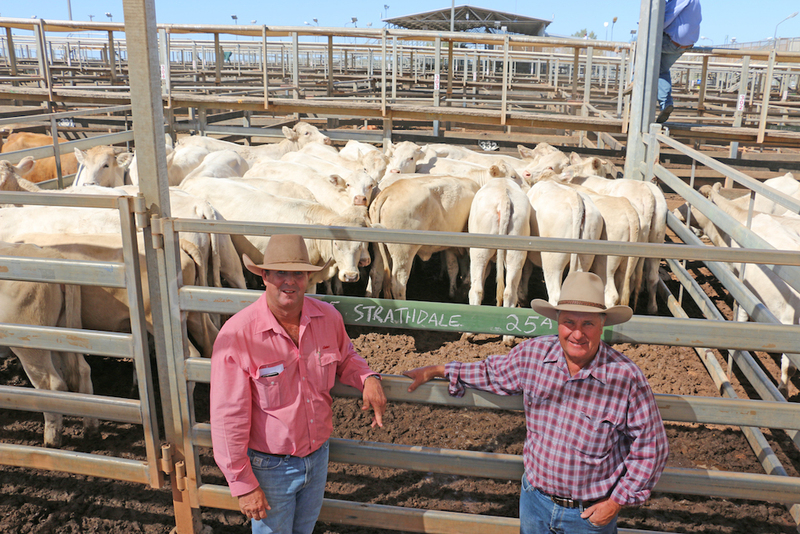 Justrouble Past Co, Coalbah, Glenmorgan sold Simmental cross steers to 306c/kg, reaching a top of $734 to average $591. Ace Farm Inv Pty Ltd, Bellevue, Roma sold Charolais cross steers to 304c/kg, reaching a top of $912 to average $703. The Charolais cross heifers sold to 252c/kg, reaching a top of $691 to average $590. Tarrina Trust, Tarrina, Tambo sold Cross breed steers to 302c/kg, reaching a top of $954 to average $809. The Charolais cross heifers sold to 262c/kg, reaching a top of $750 to average $623. DW & JL Sullivan, Studley, Roma sold Santa cross steers to 296c/kg, reaching a top of $1,346 to average $1,326. MA & LM McCoy, Stockholm, Roma sold Brangus steers to 292c/kg, reaching a top of $1,180 to average $1,180. IT & LA Houston, Reach Far, Wallumbilla sold Charbray steers to 278c/kg, reaching a top of $1,391 to average $1,319. Heifers under 220kg topped at 282c/kg and averaged 256c/kg, while heifers in the 220 – 280kg range topped at 268c/kg and averaged 239c/kg. Heifers in the 280- 350kg range topped at 288c/kg, averaging 243c/kg. Heifers in the 350-450kg range topped at 288c/kg, averaging 257c/kg. Rob Cornish Electrical Pty Ltd, Strathdale, Mitchell sold Charolais heifers to 288c/kg, reaching a top of $1,108 to average $1,039. TR & KI Burns, Colgoon, Surat sold Santa cross heifers to 276c/kg, reaching a top of $1,001 to average $910. RW & MJ Rowbotham, Bomar, Roma sold Angus cross heifers to 274c/kg, reaching a top of $580 to average $550. Luckona Holdings Pty Ltd, Luckona Downs, Wallumbilla sold Angus cross heifers to 274c/kg, reaching a top of $469 to average $469. Myroolia Partnership, Myroolia, Bourke sold Charolais cross heifers to 270c/kg, reaching a top of $585 to average $484. Campmac Pty Ltd, Saramac Downs, Wallumbilla sold Charolais cross heifers to 270c/kg, reaching a top of $559 to average $473. Brett & Sandy Southern, Gladfield, Mitchell sold Angus heifers to 268c/kg, reaching a top of $745 to average $681. Cows in the 300-400kg range reached 199c/kg and averaged 140c/kg, while cows in the 400kg-500kg range reached 224c/kg and averaged 180c/kg. Cows over 500kg topped at 234c/kg, averaging 208c/kg.